BestConsent puts our customers’ needs first. We offer low monthly subscription fees to fit any budget. Whether you are a small start-up clinic or a large healthcare facility, we have packages that will suit your needs without breaking the bank. We beat competitor’s prices every time! 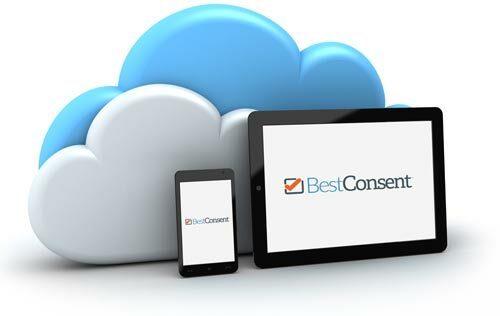 BestConsent is on a HIPAA compliant cloud. BestConsent’s comprehensive HIPAA compliant hosted solution meets all relevant standards, optimizing security and provides the best in class network infrastructure, physical security and technical controls, all which helps to ensure your patient’s PHI (patients health information) is protected and secure. BestConsent strives for 100% customer satisfaction. If the BestConsent software does not meet your expectations, we are happy to continue working with you to make it perfect or terminate your contract with a 30 day notice. We are always happy to listen to your feedback, whether it be positive or negative. Your comments can help us build a better product for you and future customers. BestConsent.com makes it easy for you to order the electronic registration package that suits your needs. Simply upload your logo and other information when you submit your order and we will begin to customize BestConsent for you right away. Your patients will be delighted to start signing forms electronically. BestConsent’s design have the flexibility to push information into your EMR or pull information from your EMR. BestConsent’s can store the consent forms and have an audit trail of the integration that occurs with your EMR. This integration works with any EMR including EPIC, Cerner, Athenahealth and Allscripts to name a few. We work with Microsoft, IBM, HP and Dell systems and cloud solutions easily. All with a seamless ability to integrate with any EMR’s system. BestConsent uses your logo and customized content to create your forms and push and pull data and forms into your EMR, based on your needs. Our team will contact you, after you submit your order, to clarify some information and ask you some important questions. They are dedicated to providing you a software product that is customized just for you. BestConsent product support is always there for you, every step of the way. Our team supports you from initial set-up of the system to issues with change management in your office. BestConsent developers will listen to your needs and make changes on an as needed basis. Our commitment is to you and helping you find solutions to all of your admissions software needs. BestConsent runs in your browser as a cloud-based system. The software runs smoothly on any type of device, so you can choose to purchase whatever equipment works best for your practice. Our set-up team will help you as much or as little as you like, with choosing the best equipment.